Whether at work or home, let this album bring you into a sweet and quiet frame of mind. 40 minutes (10 tracks) of peaceful, popular hymns performed on acoustic piano. Dedicated to my sweet mom! 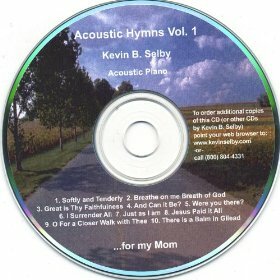 After hearing “An Acoustic Christmas” in the winter of 1999, my mom wanted me to produce a CD of her favorite hymns that she has loved through the years. I remember asking her to get me a list of 10-15 hymns that I could use to develop the track list for this CD. I think I got closer to 45 hymns (enough for at least 3 or 4 CDs!). From that list, I selected 10 hymns and began the process of recording them. These hymns happen to be my favorites as well and I truly look forward to additional volumes of Acoustic Hymns in the coming years. This CD is perfect for playing quietly through the house and I believe it will add a peacefulness to your environment that will allow you to think of God and what He has done for us. I dedicate this CD to my dear mom because it was she that made sure I practiced at least 1 hour a day as a child growing up. She put up with my improvisations to classical songs and somehow managed to keep me in piano lessons until I was old enough to realize that I wanted to continue with this piano thing! My father was also a great inspiration to me as a child. I can remember him playing the “Pink Panther” theme when I could barely do scales and to this day he still has a superb ear for music and provides excellent comments to my work. In fact, I presented a demo of this CD to my parents before releasing it and I left their home with 5 pages of notes detailing how each of the songs on this CD could be made better. I agreed with about 95% of their comments and made the changes accordingly. This CD would not have turned out the way it did without their guidance and love of sacred music. Lastly I would like to thank the Author and Finisher of all, and that is God and Jesus Christ, His Son. Without His inspiration and guidance in my work, this CD simply wouldn’t happen. If this CD provides you with peace and a desire to know Him better, then it is all because of Him. I’m just His instrument which allows Him to communicate His desire to know you better. This entire CD was produced using a SoundBlaster Live Platinum sound card and Cakewalk Express 8.0 with the GP1 Grand Piano Soundfont by Alan Cheung. I then recorded .wav files of each track using SoundForge XP 4.0 and the Auditorium 1 reverb within the Platinum.